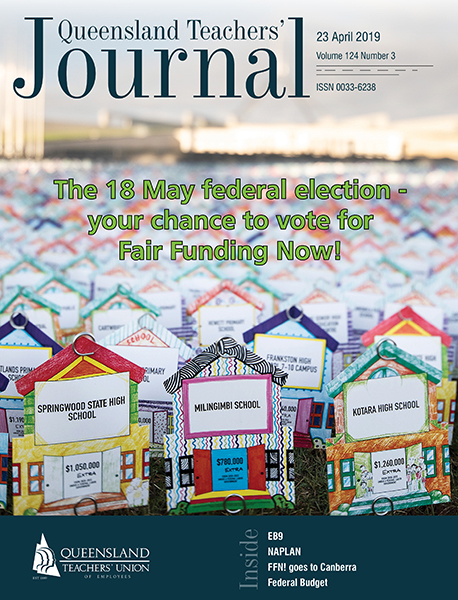 I thought it would be difficult to write an editorial just after the Morrison government’s Budget that would still be current when the Journal arrived in schools in the middle of the election campaign. It wasn’t difficult … because it forced me to focus on what would not have changed, the enduring, rather than the carnival of the elections campaign, of which I was tempted to use Macbeth’s lamentation of life: “A tale told by an idiot, full of sound and fury, signifying nothing”. What then is enduring? Just this: the Liberal and National government has failed, and nothing better can be expected of it. The only way to change the rules – of education, of industrial relations, for a progressive society that cares for those less well off – is to change the government. That is our opportunity in the federal election on 18 May. It is not to be squandered. In late 2011, the Gonski review commissioned by the Labor government put forward the concept of a schooling resource standard (SRS) that would fund schools to meet the goals of the Melbourne Declaration and address six factors of educational disadvantage for students. In 2013, Labor committed, through a combination of 65 per cent federal funds and 35 per cent state funds, to fund schools to the schooling resource standard by 2019. The Abbott government that was elected that year said that it was on a “unity ticket” with Labor in the face of the “I Give a Gonski” campaign of the QTU, teachers and parents. But it lied. No sooner was it elected than it sought a return to the discredited SES model that the Gonski model was to replace. In 2023, 99 per cent of state schools across the country will still not be funded to the SRS. A child will have been able to go through their entire schooling while this political debate has gone on, and never have had the funding in their school so that they could achieve their best! In contrast, 99 per cent of private schools are funded beyond the needs of their students from government grants alone, BEFORE school fees. With apologies to electrical workers and the ETU, there is no greater failure of privatisation and the ideology on which it is based, than the privatisation of VET and the gutting of TAFE. The parade of failed private provider companies, the students left with debt and without qualifications, the dodgy courses, the “iPad for enrolment” schemes and the need for the government to spend taxpayer dollars to forgive fee debt (in other words, write off student debts for money paid to dodgy private providers that mysteriously disappeared) is the stuff of royal commissions. The Morrison government announced an increase in apprenticeships in the 2019-20 Budget, but neglected to mention that the number of apprentices is still well below historical levels because of its earlier cuts. There are all sorts of kids out there (and their parents) who don’t aspire to a university education but just want a quality TAFE qualification. As we transition from a carbon energy system and economy, will private providers provide the re-training for good jobs in developing industries? I think not. We should not forget Labor’s historical flirtations with private VET, but it has now committed to negotiating with state governments to ensure that two-thirds of all government VET funding (state and federal) goes to TAFE – the quality provider of VET for over a century. The Abbott/Turnbull/Morrison government has failed on VET. To change the rules on VET and TAFE, you have to change the government on 18 May. Queensland teachers operate in the Queensland state industrial relations system rather than the federal system, but a fair industrial relations system, not just for us but for all employees, is one of the Union’s core objectives. The current federal industrial relations system is profoundly broken: casualisation of employment and labour hire; minimum wages not keeping up with the cost of living; cuts to penalty rates; employers terminating agreements to cut pay and conditions by 30 per cent; wage and superannuation theft by employers; restrictions on the right to strike, and more. The ACTU has mounted the Change the Rules campaign to seek a better, fairer deal for Australian workers. The changes that Australian workers are seeking are supported by Labor, the Greens and the Katter Australia Party. The Liberal/National government has made industrial relations in this country more unfair. Time for them to go. To change the rules for the better, you must vote to change the government on 18 May!